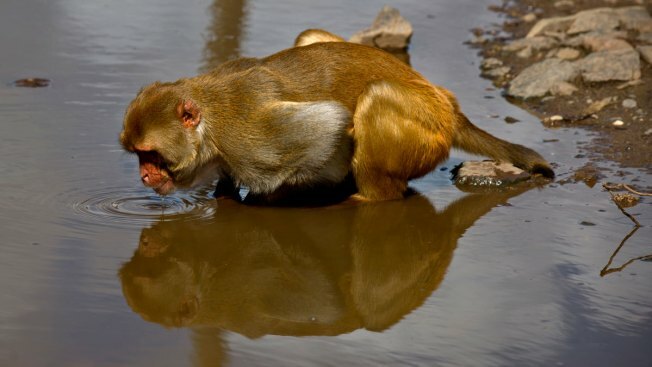 In this Wednesday, Oct. 4, 2017 photo, a monkey drinks from a puddle on Cayo Santiago, known as Monkey Island, in Puerto Rico, one of the world’s most important sites for research into how primates think, socialize and evolve. Researchers have been spending much of the year on the island studying everything from the monkeys’ eye movements to the genes and behavior of socially aberrant individuals that may provide insight into the causes of autism. As thousands of troops and government workers struggle to restore normal life to Puerto Rico, a small group of scientists is racing to save more than 1,000 monkeys whose brains may contain clues to mysteries of the human mind. One of the first places Hurricane Maria hit in the U.S. territory Sept. 20 was Cayo Santiago, known as Monkey Island, a 40-acre outcropping off the east coast that is one of the world's most important sites for research into how primates think, socialize and evolve. The storm destroyed virtually everything on the island, stripping it of vegetation, wrecking the monkeys' metal drinking troughs and crushing the piers that University of Puerto Rico workers use to bring in bags of monkey chow — brown pellets of processed food that complete the primates' natural vegetation diet. "All of our tools were destroyed," said Angelina Ruiz Lambides, the director of the Cayo Santiago facility. "Does FEMA cover this? Does the university's insurance cover this? I don't know." Incredibly, as far as the scientists can tell so far, the monkeys survived the direct hit from the hurricane, perhaps by seeking high ground and clustering together at the base of trees. No bodies have been found and a census is not detecting large numbers of missing macaques. The island's history as a research center dates to 1938, when the man known as the father of American primate science brought a population of Indian rhesus macaques to the United States. Clarence Ray Carpenter wanted a place with the perfect mix of isolation and free range, where the monkeys could be studied living much as they do in nature without the difficulties of tracking them through the wild. Since then the 400 or so macaques have reproduced and expanded their numbers, becoming the world's most studied free-ranging primate population and something of a living library. Every animal born on the island is tattooed for easy identification, and the skeleton of every one that has died over nine generations has been saved for future reference. About 100 have had their entire genetic makeup sequenced, and hundreds more have had at least some of their DNA analyzed. Researchers from Yale, the University of Pennsylvania, New York University and others have been spending much of the year on the island studying everything from the monkeys' eye movements to the genes and behavior of socially aberrant individuals that may provide insight into the causes of autism. 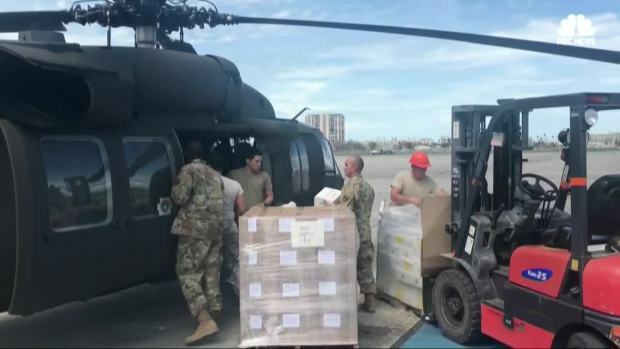 The Trump administration is fielding sharp criticism from Americans over its response time to Puerto Rico days after Hurricane Maria left the majority of the island without water or electricity. Some say the Trump administration did not respond as quickly to Puerto Rico as quickly as it did to Texas and Florida after both states also suffered heavy damage from Hurricanes Harvey and Irma. "It's completely unprecedented in its breadth and size," said James Higham, a professor of biological anthropology at NYU who is studying the monkeys' behavior, cognition and communication. Now the university staff and local employees who keep Monkey Island running are frantically ferrying bags of chow in a tiny skiff, feeding the macaques a survival diet and trying to reassemble the rainwater collectors and drinking troughs that keep the animals alive in the tropical sun. Mainland scientists are bringing in equipment from chain saws to a portable pier, funded by tens of thousands of dollars raised so far in university departments and online. Complicating the effort, the monkeys all carry herpes B, a version of the virus that is harmless to macaques but can be fatal in humans. Anyone who comes into contact with monkey saliva or urine must undergo rigorous decontamination and treatment with antiretroviral drugs. Humans also pose risks for the monkeys. Because the hurricane destroyed the island's chemical toilet, researchers and workers can stay only until they need a bathroom break: Human waste could start an epidemic that could wipe out the monkeys. 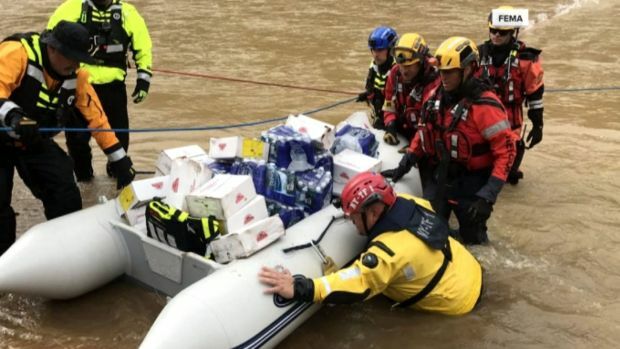 While the rescue effort is heroic, "it's not sustainable," said Higham, who is bringing in a container full of supplies, possibly on a ship that would anchor off the island. "They're doing the best they can do under very difficult conditions, but it needs help and attention." 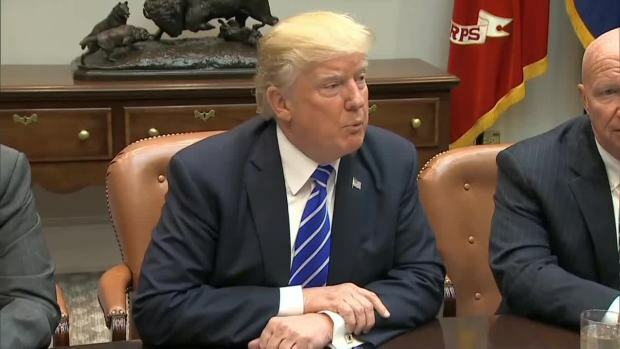 President Donald Trump will visit Puerto Rico on Tuesday to view the hurricane damage personally. Trump talked about the rescue and recovery efforts, and the challenges presented due to the island's location.